EDITOR’S NOTE: A previous version of this story had two factual errors. We erroneously reported that Vega Collegiate Academy reported the highest math scores in the state. Vega Collegiate reported the highest growth in math scores in the state. The previous version also stated that a majority of APS community members wanted more charter schools as their preference in a Blueprint community forum survey. A majority of the attendees preferred school choice, not charter schools. We regret the errors. Demarques Dennis struggles with writing poetry, just like most high school students do. Not long ago, he was a school drop-out who struggled with doing and selling drugs. Stephen Carter works on his poetry course, Nov. 12 at the APS Avenues alternative school. He’s one of thousands of students in Aurora Public Schools finding a road to success in a program that’s not like what most people recall as public school. The school district is chock-full of students like Dennis, struggling with school because their round lives don’t fit into traditional square school molds. APS leaders know that one size does not fit all for the wildly diverse students and struggling school district. If you look closely at the demographics and proficiency scores, one size doesn’t seem to fit anyone in APS. Nothing fit for Dennis and his friend in poetry class, Stephen Carter. Dennis, 18, said he rarely went to his classes at Overland High School, and when he did, he felt stupid when teachers called on him. He stopped going to school altogether. Now, Dennis and Carter are writing poetry and listening to rap music at school for their English credit. 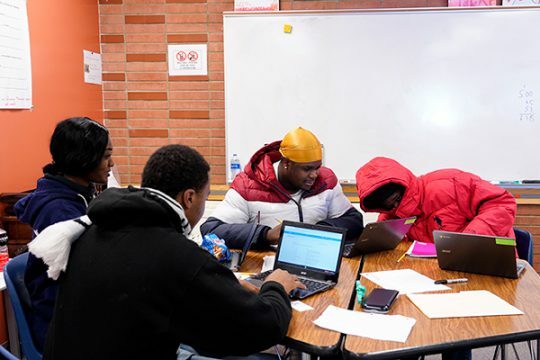 From left, Zyon Cooper, Semaj Anderson, Stephen Carter and DeMarques Dennis, students at the APS Avenues alternative school, work on a variety of subjects from Astronomy to Poetry and Journalism, Nov. 12 at APS Avenues. The four, as well as other students at the school work to fulfill the required courses in order to get their high school diploma. Carter, wearing a gold durag and a puffy ski jacket, is proud of his poetry. Dennis is proud of who he’s become while studying with the small cohort of students attending APS Avenues full-time. 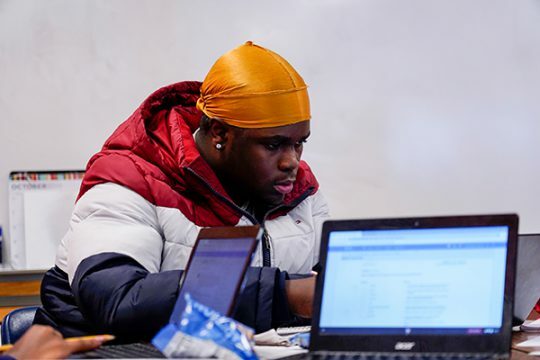 The program is housed in a small, square administrative building, and also provides online classes for students who would otherwise have dropped out, who are confined in Aurora hospitals, or who simply need to finish a few courses online to graduate. District officials say they know there is no style or type of school that fits all of the district’s wildly varying needs. They’re well underway in creating a district that offers an entirely different vision of schools in Aurora. When the evolution is complete, the district won’t look like many suburban districts, where each class inside each school looks and acts just like any other. Officials say APS is going to offer a variety of choices to students and their families. They just needs to figure out how it gets there. The stakes are high in APS, a majority-minority district where 70 percent of students receive free and reduced price lunches. It’s a school district where almost 40 percent are learning English as their second language, and, despite students who meet or exceed state testing standards, every grade level districtwide does not meet state expectations in ever category. Aurora is largely a city of immigrants – 20 percent of Aurorans are foreign born – and schools like Crawford Elementary School struggle with bringing refugee students up to speed even on the most basic of skills. Test scores remain abysmal, but some gains have been made. Although 13 poorly-performing individual schools were under state monitoring as of September, the district as a whole improved enough last year to avoid a takeover from the state Board of Education. Compounding the challenge already existing in the district because of its rich diversity, APS is also losing students in some areas while gaining students in others. Gentrification in northwest Aurora is driving out families from traditionally low-income neighborhoods, while the city’s eastern flank is dotted with far wealthier sub-developments requiring schools of their own. The district is doubling-down on flexible, school-choice programs, offering options that include charter schools, magnet schools, alternative schools, online schools, traditional schools and other individualized programs to buck a one-size-fits-all mentality. A period of community feed-back gathering just ended, and the district’s vision isn’t without criticism from teachers, but it’s undeniable that the vision of school choice has found a home in APS. 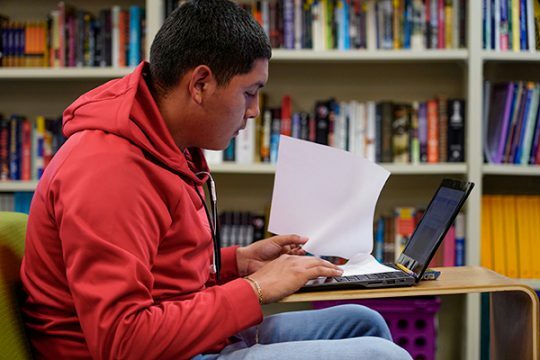 Felix Solgado studies a packet for his English class, Nov. 12 at the APS Avenues alternative school. New ideas aren’t foreign to APS leadership, which has embraced reforms to turn around test scores that have ranged from shining to abysmal. Before retired Air Force Gen. John Barry was CEO of aviation museum Wings Over the Rockies, he served as superintendent of APS between 2006 and 2013. Barry was well aware that he inherited a struggling program. “The bottom line in the school district was that student achievement was going down, graduation rates were going down, and we had a pretty bad truancy problem,” Barry said. He was adamant that classes fitting individual students’ needs and interests would boost proficiency scores – like incorporating modern music into English poetry class at Avenues. Charter schools offer one of the district’s choices — public schools with freedom to experiment and also raise private funding. Prior to 2006, there were two charter schools in APS. Barry helped approve four more despite general hostility to the programs that persisted on the district school board. 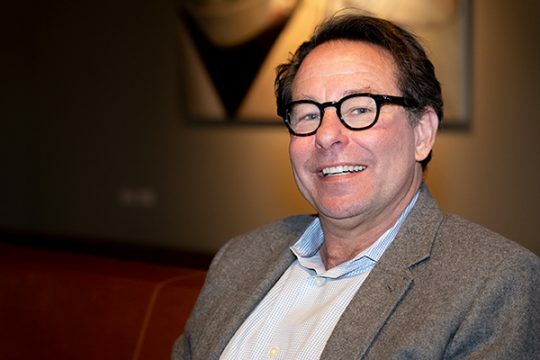 Barry introduced choice to the district with Vista Peak, a school with career-driven curricula that funneled students into career paths and helped place them at internships in Aurora. Students can choose whether to take STEM, business administration, arts and communication, or health sciences classes at various high schools and the Pickens Technical College. Aurora Public Schools Superintndent Rico Munn is seen in a reflection from a framed Franco Harris jersey, which hangs in his office. Drop-out rates halved and the graduation rate rose from about 40 percent to 60 percent. Voters also approved tax increases for expenditures and construction that boosted district options. 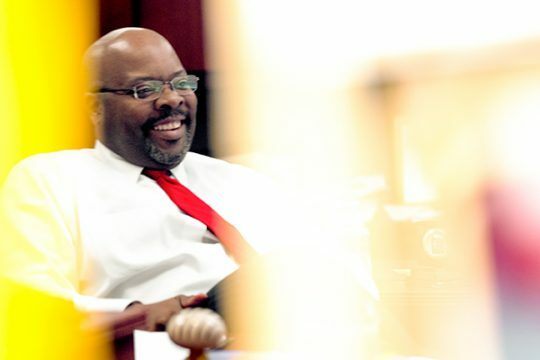 When Rico Munn joined the district as superintendent in July 2013, the district was performing so poorly that the State Board of Education was watching reforms adopted by the district, which included authorizing more charter schools. The district also created so-called innovation zones, or traditional schools with relaxed rules and more autonomy from the district. Munn shared Barry’s goal to innovate in the district, said Matt Cook, who served on the APS school board from 2005 to November 2013. “He had an agenda that he was working,” Cook said. The same year, education analyst group A+ Colorado released a scathing analysis of APS that said the district was one of the worst-performing in the state. Between 2010 and 2014, APS students tested about 20 points lower than the state average in math, writing, and reading across all grades, according to the report. Munn brought in six more charter schools and invited popular Denver charter school network Denver School of Science and Technology, aka DSST, to satisfy community demand for STEM programs. About 5,200 students were enrolled in charter schools as of late September. There are about 33,000 students in the district’s traditional schools, according to an APS demographic report. 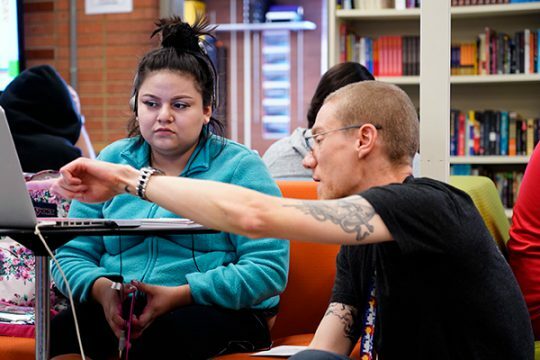 Robert Hultman, right, helps Emily Gonzalez with her art assignment, Nov. 12 at the APS Avenues alternative school. Hultman has been a teacher at APS Avenues for three years, and prior to that was an instructor for the APS online school. More kids in more charter schools are coming, officials say. The first DSST school opens next year, and, a middle school. It will be followed by another DSST middle school and two associated high schools. One charter school, Vega Collegiate Academy in northwest Aurora, garnered the highest growth in math scores of all schools in Colorado. Munn also oversaw the creation of more pilot programs like APS Avenues and worked with the Community College of Aurora to install two programs inside Rangeview and Hinkley high schools. Gains are being made. Last year, the Colorado Department of Education reported that test scores were growing. However, all grade levels still did not collectively meet state academic standards last year, and the graduation rate was still more than 10 percent below the state average. Test score growth also remains divided by race. White, wealthier students are improving faster than students of color, according to the A+ Colorado report. Nancy Todd, a former teacher in Aurora’s Cherry Creek School District, is now a state senator and expected to chair the Senate Education Committee for this session. Todd said flexibility is a logical, guiding principle for APS. Students and their families are highly mobile and move often, she said, and many in low socioeconomic neighborhoods pocketing northwest Aurora require programs specifically suited for them. Todd credited APS leadership for taking a “more measured” approach to school reforms than Denver Public Schools, which has been criticized from accepting charter schools erratically. “Aurora says, ‘We can offer some other kinds of options. There can be charters, and magnets, and different things, but it doesn’t mean you shut down the quality of those neighborhood schools,’” Todd said. Bryan Lindstrom, a social studies teacher at Hinkley, said he is skeptical of the district’s vision. Charter schools, he said, disadvantage students in traditional schools by spreading already thin resources thinner. He said students in their more traditional neighborhood schools will have less opportunity, whereas some students have more. While APS creates more options for students, not all can access individualized programs. A traditional school that works financially when it has 500 students can’t work at all when it has only 200 students and less than half the resources, critics say. Van Schoales, CEO for A+ Colorado, sits for a portrait at the office space of A+ Colorado, Nov. 13 in Denver. Myez’s parents and teachers were able to connect him with staff at Avenues. “We became a family,” he said of the students at Avenues. He’s faring better in subjects he used to struggle with. “There is a lot more work to do, but we are definitely moving in the right direction,” Munn said. This month, the district is wrapping up a period of public feedback on school choice measures, to gauge community support for a district moving toward non-traditional schools. The process, called Blueprint APS, involved months of focus groups, surveys, and public forums where parents and others voted on some of the measures the district is already providing. In his office in August, APS Superintendent Rico Munn produced a dry-erase marker and walked to a white-board mounted on the wall. If you went to school before the last 10 years, you probably had a traditional experience — like the Huxtable kids on the Bill Cosby Show. The results of the community engagement will be released next month, and ti will suggest where the district should build schools in the next decade – if they are built at all. For instance, parents could fall behind a growing demand for more choices already in place: online schools, homeschooling, and more charter schools filling niches like STEM or arts classes. Even so, these ideas could be implemented in news ways. For example, students can already take some classes online through APS Avenues. They could supplement home schooling with online classes, and visit schools and community college classes to earn their degree on their own terms. “They want a place where they can just get through high school,” Program Coordinator Ran Jung said of the students at Avenues. That approach seems to be king in APS. In another scenario, it’s possible that parents could prefer magnet schools above all else, where students travel across the district to focus on a specific focus like math or the arts. The district could pair the expected feedback with their demographic analyses, which has revealed that APS is losing students at a high rate as demographic changes sweep the Denver metroplex. About 2,000 students have left APS since 2014, largely from northwest Aurora. Students there could travel to study with students from other areas at a magnet school, or attend a charter school to fill that void. The possibilities are endless, but the momentum behind school choice will likely mold the district in the 2020s. In September, Munn and two dozen others walked into the new, sleek Mrachek Middle School for the last of four public forums the district held during Blueprint APS. A handful of teachers, parents, and at least one student filed into the seating area before a vaulted stage and large projection screen. From there, a staffer from MGT Consulting took over the meeting. The firm charged more than $100,000 to manage the community engagement aspect of Blueprint and provide technical expertise, according to the district. Questions projected onto the screen, and teachers and parents were asked for preferences from a multiple choice list: Would they like to see more charter schools, magnet schools, grade combinations, STEM opportunities, or something else in the district? The results were displayed on bar graphs, and a majority chose school choice as their first preference. It was a welcome sign for Noah Stout, the advocacy coordinator at charter network DSST, which will open its first school in Aurora this week. From there, the 15 or so parents, teachers and student split into two groups, one for Spanish speakers and one for English. In the English-speaking room, the group agreed that more needed to be done for APS students. A teacher complained of little funding for STEM education, and said she had to apply for a competitive, $100,000 grant from Northrup Grumman to keep her students engaged. A couple with their daughter, their lone student, agreed, lamenting that the STEM programs were all too far away from where they lived. Kenneth Somers, who works in APS’ equity office, said he was concerned that wealthier, whiter students had more opportunities in the district compared to the majority of minority students. “If you live in that part of the district, you’re good. But if you live in that part, you’re not,” Somers said, referring to north and eastern sections of the city. APS has a bad reputation, said Prince Dyke, an active duty Air Force officer stationed at Buckley Air Force Base. He said he had just moved into the area from Hawaii and chose to live in Cherry Creek, because the school district had a better reputation. After the forum ended, Munn said about 200 people attended the previous community forum, which was on a Saturday afternoon. More than 1,000 people gave feedback through the Blueprint in various forms – “a pretty good sample size,” he said. Bruce Wilcox, president of the Aurora Education Association union, disagrees. He sits on one of the committees charged with suggesting how to implement findings from Blueprint. He said he supports the process, in theory, but that turnout has simply been too low. Wilcox said the union encouraged all of their members to take the survey and weigh in, to combat a possible skew toward alternative options, like charter schools. “If you ask the question the right way you get the answer you want,” he said. Bryan Lindstrom, the social studies teacher at Hinkley, said he’d like to see 80 percent of the families in APS reached with the questionnaires. There’s a lot up in the air as the district gages community support, but more school choice options could be brought to APS. Van Schoales, CEO of analyst group A+ Colorado, said the district is in dire need of reforms either way. “People should be running around like the building is on fire,” he said.